[Left to Right] - Reviewing the demolition of the old roof on the site of the Museum of Grand Bahama, formerly the Shannon Country Club, are Erika Gates [Museum Committee], Bruce Silvera [Freeport Construction Co. Ltd.], Michael Clough, [The Grand Bahama Port Authority Limited], Chantal Bethel, [National Art Gallery of the Bahamas], Janet Albury [Museum Committee]. Freeport, The Bahamas - A new historical Museum has been announced for Grand Bahama Island and will be located in the former Shannon Country Club building on Magellan Drive, at the entrance to the Garden of the Groves. It is expected to become an important source of history and information about the island. It is intended to be a centre of interest and activity as it celebrates the Explorers, Pioneers and Settlers of Grand Bahama Island. Special allocation was given to The National Art Gallery of The Bahamas [NAGB], which will continue its mission to preserve and exhibit the National Collectio n of Bahamian art and to engage the history of Bahamian Art and Visual culture. Broadening its reach to its first Family Island annex, artwork will be displayed by fine artists from the collection or who have met the criteria of the NAGB with an aim to educate the local visitors in the history and development of Bahamian art. Approximately 3,000 square feet is designated for the Museum in its entirety, of which 1,000 square feet is designated for The National Art Gallery and 1,000 square feet is shared space. Amanda Coulson, Director of NAGB stated, “As an archipelagic nation, it has proven to be very difficult to share our important work adequately throughout the nation; without a dedicated space it is impossible to tour the collection or put on the type of world class Bahamian art shows that engage with our history, which New Providence-based audiences have come to expect. This generous opportunity afforded to us by the Museum of Grand Bahama will make a world ofdifference to us and—I hope—to the local Grand Bahamian community." Chantal Bethel, the Freeport-based NAGB representative—who currently serves as Deputy-Chair to the institution—was involved with the Grand Bahama Heritage Foundation for the past ten years, whose mission was to celebrate the story of the island through creating artworks where historical artefacts did not exist. “This project would not be possible without the generous donation of the building and land by Sir Jack Hayward,” stated Graham Torode, President and Chief Executive Officer of The Grand Bahama Development Company, Limited. 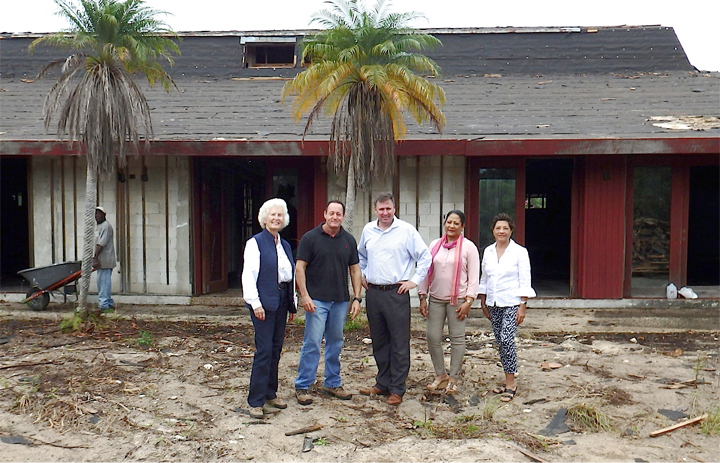 Through the donations of The Grand Bahama Development Company Limited, the Lucaya Service Company and The Grand Bahama Port Authority Limited, work has commenced on the Museum. The interior of the building was gutted several months ago and Freeport Construction Company is now in the process of stripping off the old shingles and replacing them with a new metal roof.Michael Clough, Director of The Grand Bahama Port Authority Limited and Port Group Limited, expressed his appreciation to Bruce Silvera and his team. The entrance to the Museum and Art Gallery will feature a shop that will offer for sale items with an island historical connection. There will also be a room leading off the entrance hall for audio-visual presentations and meetings. Peter Barratt has spearheaded the work of transforming the 5,000 square foot building to showcase numerous exhibits which will be displayed in chronological order starting with the Lucayan Indians who were part of the Taino culture. This is followed by the island’s maritime history which includes individual exhibits on piracy, slavery and wrecking. Next follows an exhibit on the settlements of the island and covers the peopling of the island after AD 1800 with information of the life style of the islanders, and economic activity (especially lumbering which has been of incredible importance to the island in the past). A brief detour is made with a compelling exhibit about the scourge of hurricanes. Then follows the exhibit of paramount importance in the history of Grand Bahama entitled, “The Freeport Story.” The history of Freeport since 1955 will be explained in photographs, maps, film, original records and even with hands-on computers. But the visitors’ interest should not end there. Following on from the Freeport exhibit there is space devoted to Junkanoo and the industries of Grand Bahama which are accessed down a ‘mall’ and around an appropriately named roundabout called “Ranfurly Circus”. From the roundabout, future plans call for open air exhibits: a re-constructed Bahamian Village, a butterfly garden, an ecological exhibit constructed in association with the Garden of the Groves, a bush medicine garden and a children’s playground that one day may have a small model railway replete with stations and tunnels. A re-constructed coal mine shaft where Bahamian pit props were employed may also be included as an exhibit. The Museum will be a non-profit organization and will have to rely on the generous donations of the public.There is much to be done to outfit the Museum with interactive exhibits, copying and mounting of photographs, storing and displaying artifacts after all of the renovation work is completed. This is a multi-phased project and with the help of the community, this Museum will become a reality and a hub for residents, students and visitors alike. Interested persons who are willing to donate to the Museum, volunteer their time or offer artefacts to be displayed may contact Janet Albury at 351-5310 or e-mail vipservices.fpo@gmail.com. The Museum will be a repository for historical artefacts and archival materials with a Grand Bahamian connection and of interest to all who visit the island.